We LOVE when Voki fans share their unique character creations with us. Monsters, talking dogs, hot pink hair – we’ve seen it all! To keep teachers’ and students’ creative juices flowing, we are introducing brand new characters to the line up! These characters are exclusively available to Voki Classroom users, but they can be previewed in the basic Voki editor by anyone. So, how do you know which characters are available in Voki Classroom? Easy! We added a graduation cap icon for all Voki Classroom characters! Additionally, a banner notification is visible in the editing window when you are previewing a Voki Classrooom character. To take advantage of these new characters, sign up for the Voki Classroom 15 day FREE Trial. You will have full access to 3D PhotoFace characters, 2D illustrated characters, beachgoers, and more! 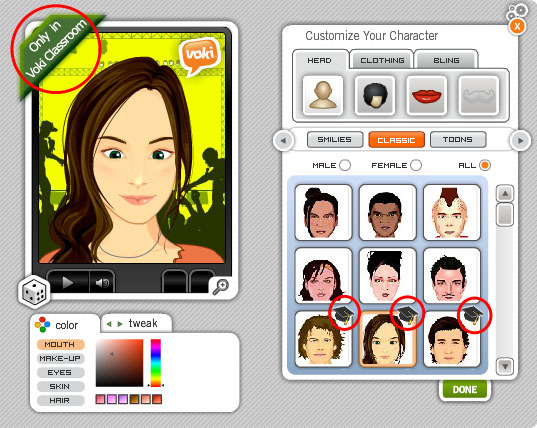 To see the full Voki Character Catalog, go to the Product page.